Today I am going to be sharing with you my ten summer essentials. It is that time of the year where the sun has finally come out and it is forever hot and sticky. I hate this feeling and will do absolutely everything I can to feel relaxed and cool throughout the summer. Everyone has their own individual unique ways of staying relaxed throughout the humid summer days but sometimes we forget about the real essential items we need to keep with us. 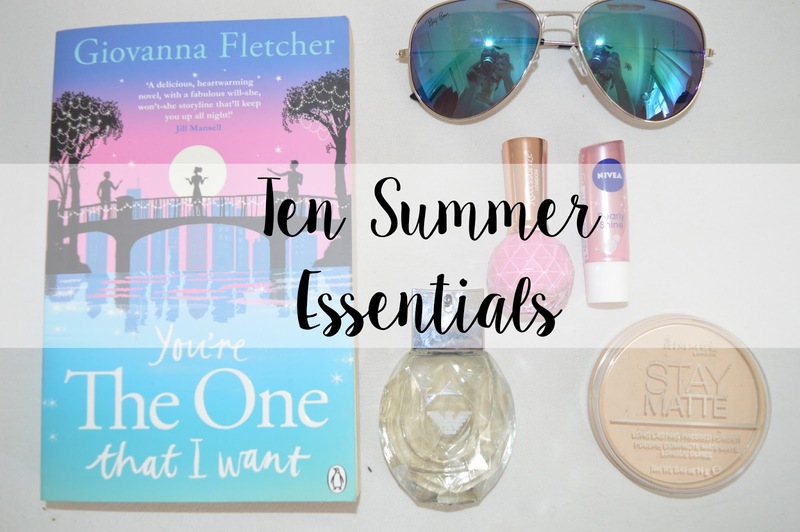 I will be throwing some of these items into my ten summer essentials which you cannot forget in your bag! Firstly, we need to have a good decent book to read, a book which you're not going to want to put down. I personally have always read a book which I cannot put down until I have finished it, however some people can pick up a book and find it really difficult to get into. You do not want to be one of those people. Look around and read the blurb of books and find one which you can really get into when you're lounging in the sun, catching a little bit of a tan (or maybe a bit of a sun burn). Make sure to check out my book haul in a few weeks time to find out what books I am currently into! Obviously another summer essential is a light perfume. I personally do not have many light perfumes and I find it quite difficult to find one that I like. In this occasion, going for a body mist can be a great alternative as they're not too heavy and you don't tend to find a body mist which you'd use for an evening occasion. One light perfume I currently have in my collection is "Diamonds" by Emporio Armani. I really like this perfume and my boyfriend's Nan bought it for me after speaking to a sales assistant who recommended this perfume to her. This perfume is fruity and floral which contains aspects of rose; a youthful and full of energy eau de parfum which features lychee and raspberry. You can wear this both in the day and night but it is very light and beautiful. It's summer and the sun's out so we are going to need our sunglasses, especially when driving! Where ever I go, I always carry a pair of sunglasses with me but I always forget to put them on which is absolutely terrible but I should remember. Sunglasses protect our eyes but they are also very trendy and you can find some beautiful sunglasses out there. I'm forever complaining of a headache throughout the summer and if I put my sunglasses on, there's a chance I wouldn't complain. So here's a reminder to myself and everyone else; wear sunglasses in summer! My fourth essential for summer is a bikini; a pretty one. If you're going on holiday throughout the summer of course you are going to be wearing a bikini for the majority of the time you are away. This doesn't mean you can't also wear one here in the UK when you're lounging in your back garden or at the beach. Bikinis not only are very pretty, but they're great for when you really don't want to be wearing a t-shirt or dress against your skin, but it's acceptable to wear when you're out. You can pick up some beautiful bikinis here in the UK from places such as; +Primark, +ASOS and +New Look. So here's the biggie; we need to keep hydrated and drink water even when we don't want too. I know I know, drinking and eating while you're hot isn't the one thing you want to do, but you need to make sure you keep hydrated while it's hot because you might not think your thirsty, but your body is! If you don't eat too, you're not going to have any energy and you'll most likely get ill. Water and food is the biggest essential throughout summer and it's the last thing you want to think about but it's the most important. Stay hydrated and always have water with you and a little snack. Summer is just like winter and you can still get chapped lips even when it's not cold. I love lip balm all year round and I cannot stand having dry or chapped lips so I tend to carry a lip balm in every bag I own and if I have a pocket, there will always be a lip balm. It is so important to take care of your lips, just as much as you take care of your skin with moisturisers, or if you condition your hair every time you wash it. Always always always remember to use lip balm and take care of them lips! Of course, we all need to have an essential piece of clothing and mine is shorts. I have never worn shorts so much in my life until this summer. The perfect pair of shorts are baggy ones and very thin ones (but so you can see through them). They are absolutely perfect for throwing on over a bikini or if you're going anywhere. You don't have to look absolutely stunning in a beautiful floral dress. If it's hot, wack on a pair of shorts and enjoy feeling cool. There's nothing worse than going out in the day time, wearing a pretty dress but sweating like there's no tomorrow. Don't be silly, and dress appropriately for the weather. This is my favourite essential, and it is nail varnish. I love nail varnish if you didn't know this already. I probably have every single shade you could ever possibly find and even then, I still don't have enough. Nail varnish makes such a difference to your hands and your feet. I honestly don't feel like myself if I don't have nail varnish on because I always have it on. My favourite shades throughout summer are pinks, yellows, light blues and oranges. You need to have your nails standing out and shining bright just like the sun! What is summer essentials without including a beauty product? I don't wear foundation so I wear powder all year round but if you are one of those girls who cannot stand looking oily or dewy then I am sure powder is your best friend. Not only does it stop your face from looking oily, but it is also a great alternative to wearing foundation throughout the summer when you just want to make your face feel like it's actually getting some air too it. I highly recommend the Rimmel London Stay Matte Powder in transparent. It's great! I love music all year round but I especially enjoy listening to the charts throughout the summer when you can lounge in your back garden with the music full blast without having your neighbours complaining. There are some brilliant summer albums currently out which you can download and they provide you with the best tunes that are currently in the charts. There are also others which include songs which were in the charts centuries ago which are still absolutely incredible. Also, having your windows undone in your car with the music full blast is also a must. Let me know what your summer essential is this year!